I recently purchased a cable from Cable Chick. The quality of their goods was only exceeded by the outstanding service given. When I ordered the cable at 4.15pm on the 23rd December I had resigned myself to the fact I wouldn't be able use the equipment for what it was intended, then to my surprise it was delivered at 8.30 the next morning. Service just does not get better than that. This company deserves all the success which will come their way. Surge Protection Board products for the best quality AV Accessories at the lowest prices every day! 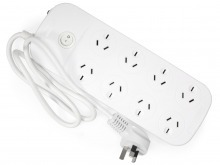 8 Socket AV Power Board with Surge Protection (White) + FREE SHIPPING! 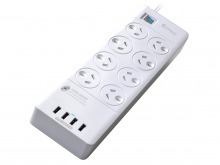 8-Socket AV Power Board with Surge Protection + 2 USB Charging Ports (Black) + FREE SHIPPING! Most Popular AV Powerboards! In-Stock & Ready to Ship! Did you know Cable Chick also have Pro Audio Cables?